Following in the Smokingpipes tradition of unorthodox career paths, Pete capped off a twenty-six year long run as a touring musician by earning a business degree focusing on marketing, merchandising, and graphic design—lending him a diverse range of skill-sets that make him an invaluable member of our merchandizing team. 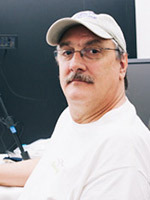 Pete serves as Lead Videographer, where he shoots and edits all the 'white-glove' videos of higher-grade offerings, as well as our blog videos and other promotional media. That's not to say he's stopped playing music though; along with boating and fishing, it still makes up a healthy chunk of his free time. As a native of Buffalo, NY, Pete's furthermore added to our other great tradition: that of welcoming into our bosom those who have migrated (fled?) to the Myrtle Beach area from the Northeast.